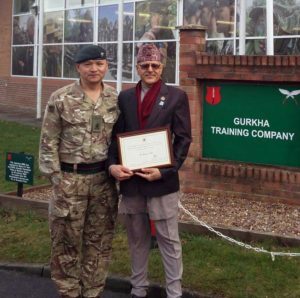 Mr Atmaram Dahal (Pandit -Gurkha Company, Infantry Training Centre, Catterick) has been awarded a General Officer Commanding Army Recruiting and Training Division Commendation. The GOC ARTD, Major General T D Hyams OBE, visited Gurkha Company and presented the commendation to Mr Atmaram Dahal in person on 8th February 2018. 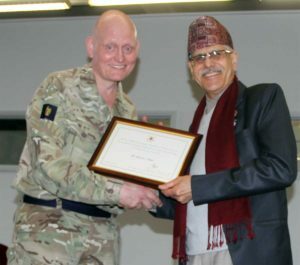 Mr Dahal (Panditji) was recognised for his exceptional support to new Gurkha trainees and the local wider community within Catterick Garrison. Amongst his achievements is the instigation of the Catterick Garrison Park Run in which over 200 Park Run enthusiasts take part every week. All Gurkha Company staff and our families would like to extend our sincere thanks to Panditji for his selfless commitment and enduring support to the local community.